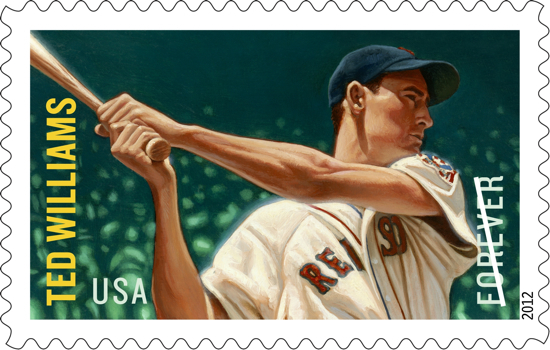 The United States Postal Service put the Ted Williams stamp on sale today along with stamps of Joe DiMaggio, Larry Doby and Willie Stargell. The official first-day-of-issue dedication ceremony was held at the Hall of Fame. In addition to the sheet of 20 stamps depicting all four players, the Postal Service will issue limited quantities of individual stamp sheets honoring each player at select post offices in their team’s cities beginning tomorrow. Go to at www.usps.com/play-ball for information. Boston postmaster James Holland will be at Fenway Park on Saturday for a pregame ceremony.